Whether you use your kitchen for parties, cooking and/or eating, it is normally one of the busiest rooms in a house. Because you spend so much of your time in this room, you should make sure its positive Feng Shui is maximized. The east and southest areas of your home are best-suited for a kitchen. Like other rooms, natural light and ventilation are best. This room should be nurtured, and as such, it is best when surrounded by four walls. If this is impossible, the outside walls should be reinforced through the use of plants, fences, etc. As with all rooms in a house, you should be able to see a person coming into the room, no matter what you are doing. This can be a challenge in this room, but you can hang a mirror when this is impossible. Another option is to use an island in the centre of the room instead of working on the counter facing a wall. Ideally, this room should not be a through fare. If this is unavoidable, then the traffic should not get in the way of the person working in this room. Once again, an island in the centre of the room sometimes solves this issue. As mentioned in the five elements page, fire and water should not be in direct contact. In this context, it means that the stove and dishwasher and/or sink should not be directly next to each other. The moderation element in this case is wood, so countertop and cupboards can be placed in between water and fire elements to improve the Feng Shui in the room. If this is impossible, a green item (decorating touch) can be substituted. The stove is a major component of the kitchen, and as such, it should be given a lot of importance. A mirror on top of the stove will achieve this goal and will also allow the person working at the stove to see the doors. The stove should not be located under a window. If this is impossible, then the curtains or blind should be kept closed while cooking… But make sure that it’s not a fire hazard! 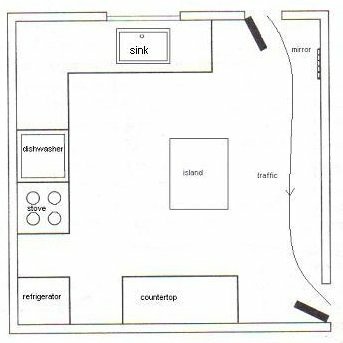 As mentioned in the bathroom feng shui page, a stove should not be located in front of or behind a toilet. Its worst location would be directly under a toilet because water chi travels downwards and will bring misfortune. If this cannot be avoided, then a plant should be kept in the bathroom and the bathroom door should be kept closed. Gas stoves are preferable to electric stoves, which are preferable to microwaves. Feng Shui and Cutlery, Utensils, etc. Blades from knifes should not be exposed. Knifes should never be hung on a wall because their location would send arrows of bad chi. They are best stored in a drawer or knife rack. Chopsticks should not be stored vertically because their appearance is too similar to incense sticks. Kitchen ustensils should be kept out of sight. Work surfaces should be kept clean and uncluttered. Ideal work surfaces are made out of wood. Garbage should be emptied regularly and kept out of sight. If you liked this kitchen feng shui information, make sure to read more about how Feng Shui affects your home.